I started working in a small Nevada town early this spring. Strangely enough, the picture I first posted on this website some months ago was of an old mine dump located in the area [picture removed]. My life as a geologist has taken me from my first field camp in Arizona in 1973, to my first paying job as a geologist in Virginia in 1975, to my first field job in Austin, Nevada in 1977, to my first camp job in Caliente, Deer Lodge (Stateline), Hot Creek Canyon, and Bowman Creek (Northumberland Caldera) - all in Nevada - and all in 1978 - finally, through many twists and turns (of fate or roads or geological strata) - to the small town in Nevada where I'm currently working, not all that far from where I started. That is to say, I consider that my real career as an exploration geologist mostly began during that long-ago summer of 1978, when I first drove north and south on Highway 8A on a routine basis. 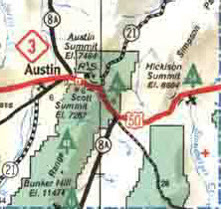 Map from NDOT, 1976-1977 Highway Map. NDOT: Highway System / Number Cross Reference with Historical System Numbers Prior To December 31, 1991. Rocky Mountain Roads: Nevada Routes 0-99. Rocky Mountain Roads: Highway 8A photos. 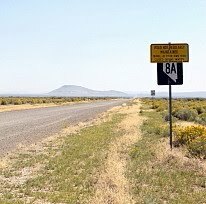 Modoc Country Living: 8A becomes CA Route 299 in Modoc County. Floodgap Roadgap: 8A in Modoc County. Floodgap Roadgap: Nevada's 1978 highway numbering system change. NOTE: This article was originally posted in another format on a now defunct website. The date shown here is the original upload date, not the date this posted to Blogger.